Reading some of Linda O’Neil’s poetry on her blog ( http://www.poetrypf.co.uk/lyndaoneillpage.shtml) sent me back to my favourite war poets, Wilfrid Owen, Sigfried Sassoon,Isaac Rosenberg, Alun Lewis, Edward Thomas and many others, and to France where they fought. I’m a regular visitor to France, sometimes to visit the World War I War cemeteries there, sometimes to cruise the canals, and sometimes I can combine the two. Reading Linda’s lovely poem Embroidery, which I think we can call a homage to the poet Wilfrid Owen, reminded me of the time I visited, not the vast fields of War graves, but Owen’s grave in the little French cemetery at Ors in north eastern France near the site of the battle to cross the Sambre Oise canal. He was killed here, just one week before the Armistace of 1918. Today his body lies, not in Poets’ Corner in England, but in a tranquil plot in the British war graves section of Ors’ village cemetery, a short walk from the place where he died. Britain’s greatest war poet, Owen wrote what was, by any standards, poetry of a rare compassion and beauty, war poetry that did not hesitate to describe unseemly death and disablement in ways that had never been attempted before. ‘My poetry is in the pity’ said Owen, and it is the pity and the compassion that we take from the poems. My first visit to his grave was made nearly 20 years ago when, together with members of the Western Front Association and the Wilfrid Owen Society, we took part in the dedication of a Memorial to the poet. The military historians who accompanied our party breathed life into statistics and Battle Plan references that our maps high-lighted. Ground was fought over and won and fought over again and lost, as we listened to the story of the attacks across fields we stood on, and marched up trails that were once dirt tracks. On the Somme the villages seem caught in a time warp. After the war most places were rebuilt exactly as they had been before 1914, and you pass through villages whose names echo with a terrible resonance down the years, Thiepval, Fricourt, Maricourt, Montauban – villages which stand today almost as they did then. What has changed is the terrain. In many places today the Somme is like a prairie. Hedges have been uprooted to maximize planting, and the flat, rolling plains are unlike the former fields of France. Despite these changes, and nearly 100 years after the 1914-18 battles, the Somme still throws up the bones of long dead combatants, old bits of ordnance and the occasional live shell. Mametz Wood is a chilling place, even on a fine day when the sun is shining. The sun was shining as we gathered on the banks of the Sambre-Oise canal to listen to the story of the battle in which Owen was killed. The geese from the nearby farm were loud in their scolding, and staring at us from the opposite bank were cows, not Germans. It was all a far cry from November 4th, 1918, when the men of the 2nd Manchesters and the 15th and 16th Lancashire Fusiliers fought long and hard for control of these now peaceful waters. Difficult to imagine on this sunny morning, the men of the Royal Engineers working feverishly to make and mend the bridges and pontoons that were carrying the assault troops across the canal: difficult to imagine the shouts of the men, the sounds of the gunfire, and the screams of the wounded. The day lives in my memory chiefly because of the French welcome. The whole town turned out, or so it seemed, for us and for the dedication of the Memorial. Representatives from the Western Front Association and the Wilfrid Owen Society took their places along with M. Houson the Mayor of Ors and dignitaries from other nearby towns, and then down the street came the band, bussed in for the occasion from the neighbouring village of le Catillon. That afternoon they had their most appreciative audience ever. Certain songs have instant access to our emotions – one of them is Roses of Picardy. As the opening bars of that sentimental old melody began, the chattering stopped and the crowd fell silent. There were few there who were not moved to tears and the relief from the emotion of the moment was almost audible when the Mayor started his speech of welcome. For some of us the pilgrimage ended as we laid our tributes on the grave of the poet and read the words on the pristine white slab that marks his burial place. I remembered his last letter home to his mother …. There is no danger here, or if any, it will be over before you read these lines .. Prophetic words. The bells were ringing to announce the Armistice when the doorbell rang in the Owen household and Susan and Tom Owen got the telegram they’d been dreading. Readers of this column with an interest in Owen’s poetry who visit France, will have no bother finding Ors. It is an easy spot to reach lying not far from Amiens (Michelin Touring Map No. 50. 200 Km. North of Paris, 40 Km. North-east of San Quentin and 25 Km. South-east of Cambrai). Walk across the bridge that spans the canal and you will see the Memorial erected to Owen just nineteen years ago by the villagers, the Western Front Association and the Wilfrid Owen Society. The Commonwealth graves are in a quiet spot at the side of the village cemetery, their pristine white slabs terribly upright in sharp contrast to the polished granite and marble of the French headstones. The bond that grew between the men who fought in World War I was of a special kind, forged in the hell of the trenches and kept alive by the inability of those on the home front to comprehend the horror of that war. Some may think that Westminster Abbey is the only fit place for a great English poet. I believe Wilfrid Owen is happier to lie at Ors with the men whose life, and death, he shared. Read Linda’s poem on http://www.poetrypf.co.uk/lyndaoneillpoems.shtml and you’ll see why my memory slipped back to nearly 20 years ago. 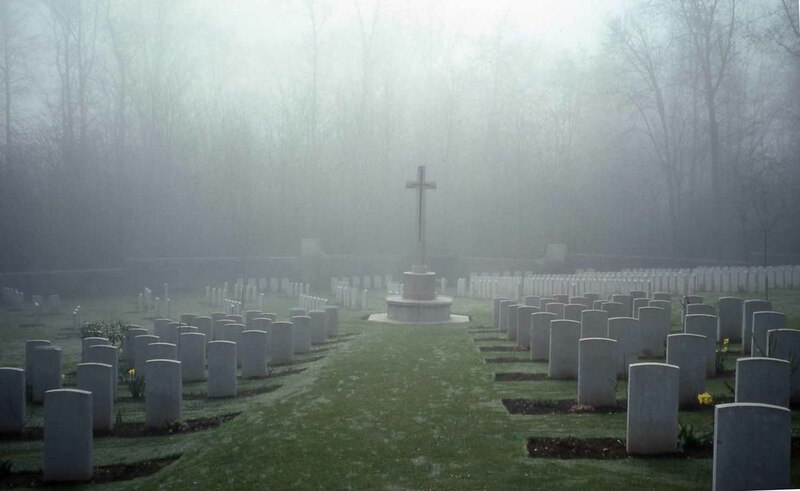 Travel takes one to strange places and although I have visited the graves in the cemetaries on the River Kwai many times and been moved to tears more than once, those upright white slabs in France seem to resonate with the tragedy of all wars. Is it the poetry the fallen left behind? Is it the prose,not just from the English combatants, but Frenchman Henri Barbusse, German Erich Maria Remarque, and the Russian Pavel Antokolsky. They have all left their mark on literature, and on lovers of poetry, but still wars go on.